The last men in the ragged gray line to emerge from the chilly morning mists and stack arms one last time were from Texas. They were all that was left of the once proud Texas Brigade of the Army of Northern Virginia, men whom Robert E. Lee said he had come to rely on “in all tight places.” Made up of the 1st, 4th, and 5th Texas Infantry and augmented first by the 18th Georgia and later by the 3rd Arkansas, they fought in every major engagement in the east from The Peninsula to Petersburg, missing only Chancellorsville. They also went west with James Longstreet's Corps and fought at Chickamauga and Knoxville. Now, only 617 were left to surrender on April 12, 1865. Edward B. Williams, an independent military historian, has chronicled the exploits of this valiant fighting unit from its formation to its surrender and beyond in almost mind-numbing detail. Indeed, information about the brigade abounds, primarily manuscripts, diaries, personal papers, and letters collected at Hill College's Confederate Research Center in Hillsboro, TX and Williams seems to have read them all. While the monograph is clearly a labor of love, writing in the active voice and some judicious editing of anecdotes and quotations would have made the narrative flow more harmoniously. The book could easily have done without some of the author's breathless hyperbole, too; i.e. “At least they were on their way somewhere even though they all know that that somewhere might mark the site of their extinction.” Please! But for those interested in detailed descriptions of the battles and camp life of this renowned Civil War unit, this book can be a worthy companion to the four volumes Colonel Harold Simpson wrote more than a quarter century ago. By taking a chronologically approach, Williams allows the reader to reference specific chapters in order to examine events in the brigade's history. Even though the brigade had eight different commanders, it came to be known by it's most colorful leader, John Bell Hood. He led the unit in its first significant action at Gaines' Mill on June 27, 1862. In crediting the 4th Texas with breaking the Union line, General Thomas J. “Stonewall” Jackson concluded “The men who carried this position were soldiers, indeed.” The Brigade suffered 611 casualties at Gaines' Mill. But the bloodletting on The Peninsula was only a preview of what was to come. The 5th Texas alone lost 214 men at Second Manassas, earning it the sobriquet “The Bloody 5th.” The Brigade fought in Miller's corn field at Antietam where, Williams relates, “the 1st Texas suffered the most horrendous losses of all in the Army of Northern Virginia...” By the time the unit reached The Wilderness in May 1864, it was down to about 800 effectives. Less than half emerged from from that blood drenched tangle of underbrush to man the Richmond/Petersburg defense lines until the last days of the war. The chapter describing the Texan's homeward trek after the surrender is one of Williams' best. The Hood's Texas Brigade Association was formed in 1872 and met “with great fanfare” almost every year until 1933. 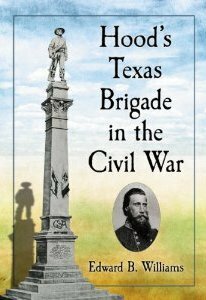 Since 1966, the memory of the Texas Brigade has been carried forward by the biennial meetings of Hood's Texas Brigade Association, Reorganized.